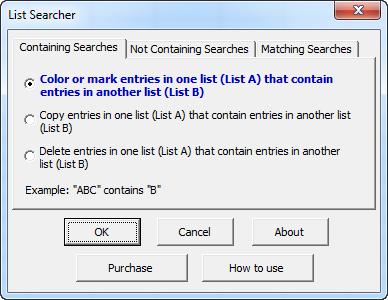 The List Searcher add-in for Microsoft Excel will quickly and easily search and check a worksheet list to see if it contains matches to words or phrases in a second list. It is compatible with Microsoft Excel 2007 to 2019 and Office 365. Henrique Jardim wrote after asking if we could make a change for him to the List Searcher: Thank you very much Robert! It is working exactly how I needed! It was really impressive how fast you made this change. I am looking forward to purchase more Excel add-ins with you. Congratulation for you and your company! You can just have the List Searcher color or mark (insert a phrase in a column) matching rows for follow-up. Or, you can have it copy or delete matching rows. If you would rather have the List Searcher identify the entries that do not contain matches to your words or phases it has options to do that. The first option allows you to color or mark matching entries (with a cell entry in a column you specify) between two lists. The last option, delete entries in one list that contain entries in another list. For example you may have a list of e-mail addresses and want to remove bad email addresses from the list. Your list of email addresses would be list A. The list of bad email addresses would be list B. And the list to list comparison will find containing matches. For example if one of your entries in your list of bad email addresses is "JohnDoe", it would find a match to JohnDoeIII@gmail.com. 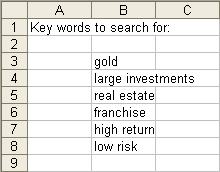 Users have used the List Searcher to find entries where survey responses need to be identified if the comments include the words "gold", "stock", or "bonds". Other users have used it to check email addresses for domains they do not want to send emails to, for words like spam, bad, and remove. The List Searcher is menu driven for ease of use. The List Searcher works by first having you identify the range to be searched. One can either just select the top cells of a range to be searched, or select a range. If one selects the top cells, the List Searcher will suggest all rows to the bottom of the data, saving you the need to pre-select all the cells. Once the List Searcher has the range to be searched and the key words and phrases to be searched for, it will display a dialog of coloring and marking options if the user has selected an option to color and mark entries. If the option to copy is selected, a dialog is presented for the user to specify the destination. In all options, a confirmation dialog to confirm the action is presented. The List Searcher can search tens of thousands of entries in seconds. To learn how to use the List Searcher, just click on the the "How to use" button on the main (first) dialog. This will open a help and exercise file with step by step instructions. And, if you need help, we are available 7 days a week. Just call our phone number which is found at the top of every page. We are located in the U.S. and enjoy talking to our customers. Address Assistant - Easily split addresses in one cell into multiple cells. Fix zip codes needing leading zeros. Duplicate Finder & Deleter - Quickly find and remove duplicates in one list or between two lists. Text File Importer - Import ASCII or text files with over a million lines!